Maybe I'm a little long in the tooth, but I just don't get the appeal of the Mighty Muggs range of collectible (non-action) figures. They fit into the same category as the rather bizarre and pointless Bobbleheads and Funko's Pop Vinyl. 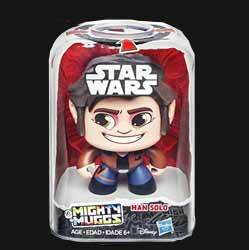 To be honest though, I actually do prefer Mighty Muggs out of all three - they're cuter and better designed - but then personally I wouldn't collect any of them. Large heads seems to be, once again, the order of the day with these collectibles, and they've tried to set themselves apart from the competition by offering each character three different expressions. Push down on the head and the face spins around. In this case Han has a look of concentration; huge smile; and angry face. Another of the plus points is that they come packaged in strong, rigid plastic packaging that not only protects the figure in the post, but also acts as a handy display case. While I'm not a fan of these figures, I'd go for these over Bobbleheads and Pop Vinyl figures every time.